I rarely write about my own travel experiences in this space, preferring to discuss a topic of interest to all of us in the industry, to help set the agenda and stimulate conversation. But once in a while I visit a place so extraordinary that I want to share with as many colleagues as I can. So please indulge me as I recount a recent trip to an area that’s unfamiliar to most luxury travelers but deserves greater attention: the Margaret River region of Western Australia. I found its combination of scenery, surfing, and wine unique, and its unhurried yet sophisticated vibe utterly captivating. Drew set up a three-day visit to introduce me to the destination. 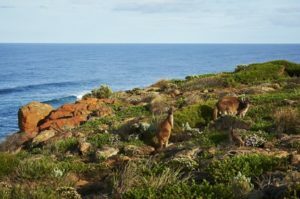 Margaret River is a simple, nearly straight drive from Perth on well-maintained coastal roads along the Indian Ocean, passing towns with wonderful names like Busselton, Dunsborough, Yallingup and Cowaramup. At the top of the region is Cape Naturaliste; at the bottom, Cape Leeuwin, which separates the Indian Ocean from the Southern Ocean. The Caves Road links the two headlands, running like a spine up the coast. The waves here are ideal for surfing, and in fact, Margaret River is one of only three venues in Australia used by the World Surf League. Yet the atmosphere here is more refined than at your typical surf destination—more Cornwall than Costa Rica. That’s thanks in part to the excellence of the region’s wines, and the connoisseurs they attract. Winemaking came relatively late to Margaret River, with the first commercial vines planted in 1967. The area is dominated by boutique, family-run vineyards, some producing only 100,000 bottles a year. It’s a place to come to meet the winemaker and his family—the big companies haven’t taken over the area (yet). Sauvignon Blanc, Chardonnay, Shiraz, Cabernet Sauvignon and Cabernet Merlot are the most common varietals. Many producers here don’t make enough to export, so you need to visit Australia to sample their wonderful wines! I recommend seeking out the 60-acre Brown Hill Estate, whose 2014 Perseverance Cabernet Merlot won Best in Show from the prestigious Decanter World Wine Awards this year. (Sorry—that bottling has sold out, and even their most loyal customers were rationed to three bottles apiece after the prize was announced in May.) Be sure to meet winemaker Nathan Bailey and his family. Along with small wineries, you’ll also find many small and very attractive hotels and inns. (Again, the big operators are not here, although AccorHotels does have a Pullman Hotel on the beautiful Bunker Bay beach.) Among the finest properties is Cape Lodge, owned by a local Perth entrepreneur. It’s a beautiful country-house hotel with just 22 rooms, surrounded by its own vineyard and 40 acres of manicured grounds. Drew and his friendly staff offer personalized service and make every guest feel at home. The restaurant exemplifies the great cooking that comes from Australia today. Chef Tony Howell recently returned to Margaret River after a stint working with his fellow Aussie Curtis Stone in Los Angeles. His small brigade here creates wonderful dishes, such as local marron tortellini with bisque and Manjimup black truffles and Margaret River wagyu beef with cabernet jus accompanied by a vast, 14,000-bottle selection of wine. Cape Lodge offers a number of created tours to help guests explore the region, everything from whale watching and truffle hunting to golf and surf school. Drew arranged for me to take the six-hour Best of Margaret River Tour, which includes a picnic lunch at a winery and a day of sightseeing. 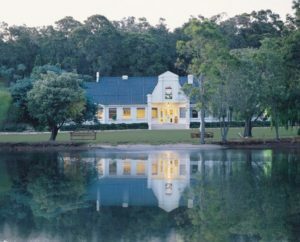 Like the best country house hotels across the world, Cape Lodge is a labor of love. The owner’s personal art collection is featured throughout the property, and all profits are plowed back into the business. It is the only Western Australian member of Luxury Lodges of Australia, a highly successful collection of independent lodges and camps in inspiring locations. Cape Lodge is also a member of Virtuoso. 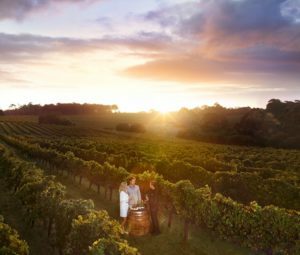 Margaret River is about fine food, excellent wines, great hospitality, interesting art galleries, stunning coastal walks and world-class surfing. It’s an unusual blend and a destination that feels undiscovered and (to adopt an overused term) still authentic. If you have not been, go. And if you have, send your friends and clients!